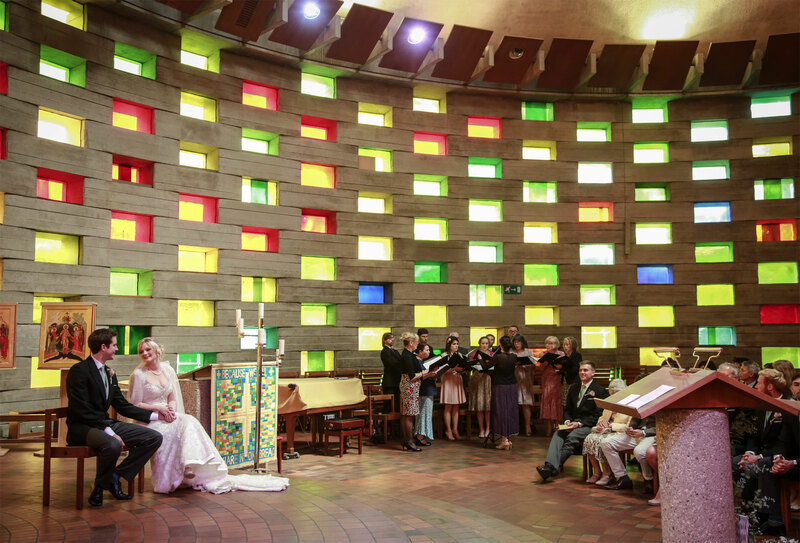 The Meeting House is a grade II* listed non-denominational meeting place situated at the University of Sussex. It was designed by the eminent Sir Basil Spence, the celebrated architect of the post war era. The structure, which is a circular 2 storey building with a conical roof, was completed for dedication in October 1966. It is constructed primarily from large board-marked reinforced concrete blocks, laid in a staggered formation with multi-coloured stained glass filling the gaps between blocks. The internal concrete faces, which have been left uncoated since construction, had become stained over the decades. In an attempt to clean the walls we carried out cleaning trials using a number of techniques including the use of dry-ice pellets. This method leaves no blast media upon completion as the pellets evaporate upon contact with the surface that is being treated. This approach was felt the most appropriate within the building where the use of grit, sand, chemical or water blasting techniques would be disruptive and totally inappropriate. The external concrete surfaces had previously been repaired and coated by us in the early 1990s as part of a maintenance package and were in need of refurbishment. Subsequently we were awarded a subcontract for treating both the internal and external surfaces of the building. All external concrete was pressure washed and a minor amount of concrete repair carried out before the application of an elastomeric coating at high level and anti-carbonation coating on the remaining areas. The sealant within the parapet was also replaced as part of the works. Repair mortars, coatings and sealants were manufactured by Fosroc Limited, with the works being completed during the university summer holidays when the campus was least busy.